So – let’s dust off the time machine and take a tour of our blog post highlights of the year. We were excited about hitting 200,000 followers on our corporate Twitter account; a big step for any account and especially so for a National Statistical Institute. At keyboard time, we now have closer to 250,000 and this post from Jo (our social media lead) shows how we have spent time and energy making sure we have the right content on the right social platforms. 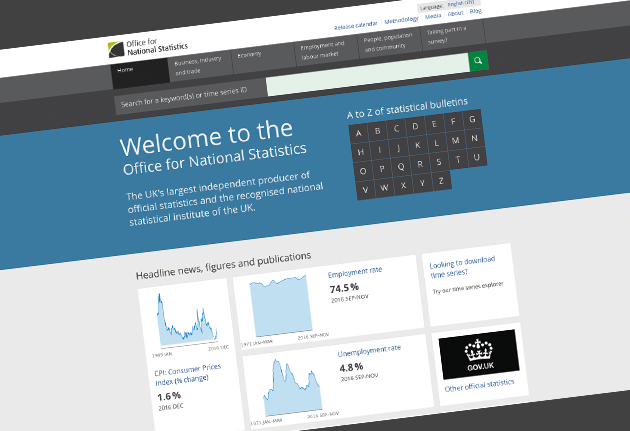 February was all about the launch of the ONS website. Product Rob put together the all important website launch blog post and looking back, it is amazing to see how much excitement was in the team at this big moment in ONS digital history. Matt (formally of this land) did a great post looking at the whole Beta phase of the project. Everyone who was involved in that project should be very proud of the great work they did. It enabled pretty much every other thing we did for the rest of the year. March saw Product Rob again talking about datasets (something that would be a theme across the year) and Lauren from “team social” took some time to explain how a tweetalong works for a big day like the budget. Rob (the other one) also put together some thoughts on what open data means to the ONS and highlighted some nice ways of using it. April saw Matt talking about what we wanted to prove. This is something that I have gone back to time and time again and have pinched for use in pretty much all other ONS projects I have been involved in. Thanks to Tom for giving us the idea in the first place. May saw the arrival of Service Managers at the ONS and this post talks a little bit about what that means. It also features a picture of my face, which suggests this was the time of the year when I arrived at team ONS digital (it has been an exhausting and thrilling few months). We also started putting out some posts about the website fixes we were making (Rob the original doing most of these). We love a chart so these are some vital reading! We also looked at the accessibility of social media content, which is not talked about enough but is a very important topic. July saw Matt signing off with a string of posts about the principles we try to use to guide the team here. These are a powerful reminder that codifying sensible things can be really important to a team. August saw some reporting on new content formats from Rob the third. This was part of a really important project for me, experimenting with different presentation techniques for our different users. Alongside this we saw a continued collection of release notes (note to self, we need to get back into the swing of things with these – they are really useful!). September saw some really helpful notes about our use of Slideshare, more of those weeknotes and a post from me around the importance of public roadmaps (posting this, with a link to our very own roadmap was one of the most bracing things I have done in a long while. I am please to say it has been a really helpful process for the service team). October was all about sprint notes, conference write ups, the arrival of Benjy into the team, Rhod talking about design patterns, Laura on proof reading and Rob on dashboards. This, perhaps more than any other month, shows the full range of things we work on across the service (and why it is such an exciting thing to work on). November saw the Data Discovery project starting to make an appearance in our thinking with a lovely post about the inception process we used to get that whole big chunk of work moving. Data Discovery is something that we will be talking about for quite some time more. Alongside that, Lisa put together some thoughts on GDP – a subject I feel I now know a lot more about than I ever thought possible. December is carrying on the Data Discovery theme with more detail on the design patterns needed for data, a check-in on sprint outputs and something from me that I haven’t finished writing yet. It also saw 2 very exciting (long overdue) digital blog post debuts. Delivery Manager Rachel took some time to discuss how we have kept our roadmap up-to-date and Al discussed the work we have been undertaking in expanding the personas we use to help guide who we undertake user testing with. All in all a pretty busy year and I can promise many more posts to come in the New Year.